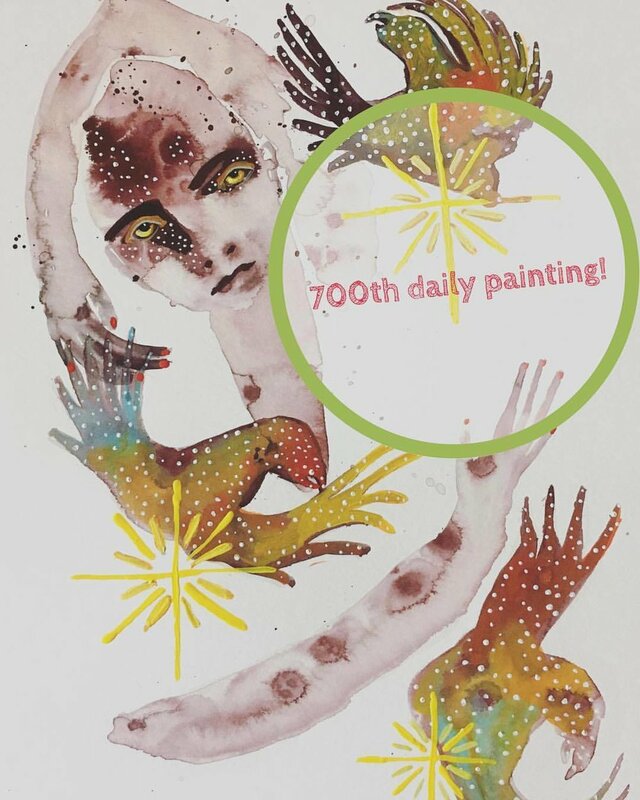 Today marks my 700th day of making a painting every day! This practice emerged from a want to put into motion my commitment to living as a "monk in the world" - through experimenting with the cross sections of art, contemplation and community/connection. Through practice, I have retrieved my true voice as a painter, as a woman and human. Art has always helped me be here more and more, and gives voice to what is so often ineffable. Art gives agency and presence to know we can change something from a blank surface or raw material into something beautiful and functional, and if we can give ourselves permission to create, we may apply what we glean to other parts of our lives. We make beds, make love, make food, make conversation. We are makers. When we make with presence and awareness, we make change. Are you willing to make? Even if you "make a mess"? I am. I'm willing to "make a mess", and I'm willing to practice with presence. Not for achieving, but for seeing what's going on in here, out there, far out there. I'm willing to keep going and to continue being humbled by the vastness and intimacy of moving from inside to outside, and back in again. Thank you for journeying with me. And arn't these daily's all shiny in their fresh frames! The Group Show opens on Friday at the Bellingham Folk School (1208 Cornwall Ave) -- 6-10 pm! Hope to see you!